I can give you 100’s of ideas right away if you want to start a side business to generate passive online income. But, you have to work hard to implement the ideas. Two years back, I was afraid of sharing my ideas, but now I don’t have the time to implement all of them. I will share my research in each field in this article. You will also get to know about how potential of making money is there in each field. I made decent money in a short period of time. I just wish that some of my ideas become useful for you and you can also start a new journey of your career. Note: I call one year as a short period of time. Why I call one year as a short period? 3 dedicated years into a college, without any guarantee of job, charged me 3,00,000 rupees in 2006. I found the job as a software engineer that was paying me 18,000 rupees for spending all my time in the office. Today, the cost of an engineering degree is no less than 10,00,000 rupees. One year is a short period if a person can work hard and even if he is able to earn 10,000 rupees only (without leaving your current job). Do you have the patience of one year to learn new skills? Yes? Go ahead and read the complete post. No? Not an issue. Find someone else who can make you rich quickly without working hard on your skills. Here is the list of resources and tools that I use for my website. A quick link to my latest income report (journey to 5 lakh per month). One year of domain hosting that range from 1200 to 5000 rupees per year. I will give you a list of all free tools that I have used for my business. You have to read a lot of books and blogs. Don’t buy any tool until you make your first dollar from your business. I will also tell you how to start a website or blog, even if you don’t have any technical knowledge. You don’t have to hire a designer or programmer to have a beautiful website. You must select a topic and industry in which you have a passion. I am passionate about credit cards, saving money using financial hacks and growing business without spending money on advertisements. I started online community to help people in selecting the best credit card for cashback on shopping/fuel/travel, for enjoying long luxury travel under budget and helping people starting a passive source of income. There are two major ways of getting traffic to your website. Google and Facebook dominate most of the traffic (in India). Don’t worry about the other traffic sources if your focus is the Indian audience. If you don’t have time to read all, click on the industry name to read specific ideas. You can create your own ideas by taking hints from what I share. I create better ideas when I work on my passion (finance, travel and marketing). Focusing on your interest is more important than chasing money. If you are the guy who is known as an entertainment material in your friends’ group, then don’t waste your talent. Get into the fun and gossip industry. Don’t be afraid. Once you start, you will learn the next steps automatically. Comedy videos become viral very easily. There are a couple of standup comedians like Kapil Sharma and Amit Tandon who have become a celebrity now. The young talent is waiting for their turn. There are thousands of comedians who are looking out for a channel to show their talent. You can help them by building a comedy club online. Funny videos of kids, puppies and cats are all over the youtube and facebook. Can you make a library where people like me can pick the right video for their content marketing? You can make money by selling the licence to startups for using the video. The person who is the creator of the original video can earn money as commission. You don’t need an innovative idea to become successful, all you need is a viable idea that can solve someone’s problem. If you are a dancer and you have interest in teaching people online then start online dance classes. You don’t have to be an expert, just be better than your students who want to learn the basics of dance. Can you make 9 short videos so that I can learn simple dance steps for the upcoming family function? Sometimes people don’t find the reliable sources that could provide them a systematic system for that simple thing. Reality shows are damn popular on TV, then why can’t there be a reality show version online? All industries are getting democratized by internet and that means individuals and organizations are losing control over the industry. Anyone like you and me can become the owner of an online TV show and complete with the branded channels like StarTV. Star TV and Amazon are already competing head to head for online TV viewer’s market share through their apps. There is a lot of scope if you can build an audience for reality shows online. If you don’t have capacity to make a product, at least, you can make a group of music lovers online. Caution: Don’t try to make a generic group of music. It must be a micro niche that you are passionate about. Like a group of Honey Singh Music Lovers, or Classical Indian Music, or Kishor Kumar Lovers..
Facebook must be the first place to begin with if you are going to make an Indian audience centric business. You must also have a website + discussion forum. At a later stage, go for moving to a mobile app. No brainer! If you have a passion to teach music, start an online school for music. You can start with a free youtube video channel, upload a couple of videos to help people in learning music. I search on youtube whenever I have to learn basics of anything. And, if I like the person, I try to find his/her online presence to learn more in detail. You can make a good business out of a music school if you deliver high quality lessons to your audience. There are many ways to look at this idea. You may become a party organizer for parties like a kid’s birthday party (all of the parents are your audience, more than 50 crore people). Or you may become an organizer for the youth parties. Important Note: Don’t try to become everything for everyone at the same time. Most of the people don’t get it. Any experienced entrepreneur will advise you to focus on one group in the initial days rather than building something for the whole industry. I would be your first customer if you can help me in creating viral videos at a low cost. You must start making videos yourself in the initial days and later on hire good video makers. Video demand is increasing every day. All the startups will have to create a lot of videos in the next few years. Videos are the easiest way to get viral in a short span of time. Most of the people don’t have the knowledge of video making. Can you come up with a fixed price video startup? 500 rupees for a 60 seconds video if the client gives the concept (storyboarding), images and text. You just have to execute. 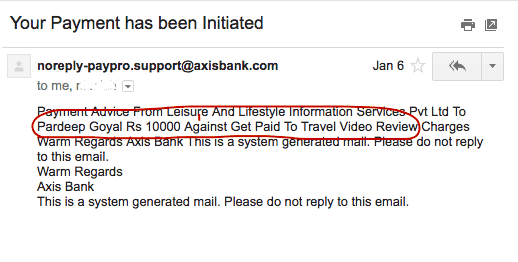 2000 rupees for 60 seconds video if you do everything yourself. Deliver the video in 24 hours with the promise of 2 revisions in next 24 hours. If you are able to execute the idea well, you can become viral with thousands of projects in your hand. Don’t compromise on the quality and keep increasing the prices. People pay higher price for the good quality work. Lack of confidence? That’s the reason of failure for most of the people. They accept failure even before starting. Success comes to those who don’t accept failure even after the actual failure. Do you know that we lost 15,00,000 rupees in my first startup? I decided to work even harder to get the success. There could be many business models in the entertainment industry. Depending upon your aspirations and risk taking capacity, you can make a nice money from advertisements (pay per click and pay per view), selling services and affiliate products. In the long run, your business model would be a partnership with big brands, celebrities, production houses and TV channels. A single guy can make about 50,000 to 100,000 rupees with a dedicated effort of one year. A team of 3-4 people can make more than 500,000 rupees in less than one year if they execute the projects with perfection. Your revenue can be multi crore per year if you become an influencer of entertainment industry (like TVF). I have not picked sports as the category, because Indians are not sports lovers, we are the cricket lovers. Cricket remains in the air throughout the year. When you are starting something for a business purpose, you must start in a business where you can get customers throughout the year. I have a very limited knowledge about Cricket because I belong to that 1% of Indians who don’t watch or discuss cricket. No, I am not an anti-national ;-). Cricket works very well just like the entertainment industry. You pick your favorite player and make a fan club about him. Read the details of businesses to get more inspiration. India is a country, but we have so many cultures within this one country. I have travelled many states last month when we were on our road trip from Chandigarh to Karnataka. Each state looks like a separate country. We should rename India as “United States of Bharat”. IPL is based on the same concept, where each region has one team. Take the idea forward, make a sports club online for your own region’s cricket. Yes, there is a business model if you can execute. The name explains it all. Pick the latest cricket news, curate interesting facts around the news and become the next cricket news channel. You will get thousands of readers from Facebook (without spending any money on marketing). Slightly different from the ordinary news, go for some interesting facts about the players, their life and the game as well. Your content can go really viral if you will execute it well. If you are really passionate about cricket, then the ideas would come naturally to you. The easiest way to make money is through Google Adsense and Facebook Instant Articles. In the cricket season, you could make a lot of money through the Ads. In the long run, you can sell cricket equipment on your website. Partnerships with sports brand can make you a real businessman in the industry. All you need is a regular flow of cricket fans on your website. Revenue from Ads would remain similar as in the entertainment industry. A single person can execute the whole project with a dedicated effort of one year. You can make your living comfortable by earning a handsome amount. If you are able to turn out the business as a huge success, you can make several crores out of it per year. Elections happen every year in some states of India. Politics domain has been always remain hot. A great opportunity if you love debating on Indian politics. Indian audience spends a lot of time on Facebook and Twitter for political discussions. BJP and AAP supporters keep rocking the internet everyday. How the current game is being played! You can join the madness and create a yet another Facebook page to defame one political party and give benefit to your favorite party. Or, you can become the legitimate source of a well-researched news and information. You can write your own opinion about the political facts. Go and read a lot of stuff about the history and political movements happened in the past. You can win the hearts of Indian audience without being biased to any party. Important Note: Be prepared to face the heat from political parties if you share any fake news or try to manipulate facts. Run your business with your own responsibility. I am just sharing an idea. Take your own risk while executing. I don’t understand political domain very well, but still, I have some ideas that can be implemented to improve the political scenario in India. Political parties make many promises during the elections and later no one tracks the progress. You can build a platform to influence the government to fulfil its promises. You can keep the track of promises, get latest information on the progress and keep the readers updates. There are different types of media and everyone puts the news in a different way. You can curate the news from different channels. The reader might be happy while looking at the opinion of all the channels and political parties at a single place. Too much information is available on the Internet. Fake news becomes a big problem for everyone. Can you come up with a system to validate if the news is genuine or fake? Since the industry is highly volatile and viral, you will get a lot of traffic from social media. Invest 80% of the time in building your Facebook page if you want to get success. The easiest way would be to earn money through display Ads. At a certain point you will become an influencer and you can get partnerships with corporates and NGOs to sell the targeted products and services to your audience. You can make $100 per 100,000 page views if you show Ads on your page. Even a single guy can handle such a business and make around 60,000 to 80,000 rupees within one year of dedicated effort. One million monthly traffic is not difficult. At later stage, there is no limit on how much you will earn. There could be some more ideas to build a better environment around politics, which has been considered as dirty till date. Please share your ideas and I will include them in the list. I was reluctant to add this topic. Unlike other topics, childcare and parenting must be handled with utmost responsibility and love. You cannot create content for the sake of getting it viral. Remember, one wrong advice can have a negative impact on the health of the mother or the baby. If you are a parent and you wish to share your parenting advice with others, you can start something on Facebook. Most of the mothers can find an opportunity to work on Facebook. Last year, I had a similar discussion with my wife Neha when she was confused about her career. She had a good sense of designs (without any designer qualification). She enjoyed sharing her parenting experience with her friends. I randomly asked her to start a website and a Facebook page in order to share whatever she learned as a mother. She started her Facebook page BeingHappyMom in July 2016 and grew to 1,00,000 likes in January 2017 without any paid marketing. Being Happy Mom Facebook fan base is growing 5000 per week without any paid advertisement. All the work and growth is organic. The page is highly engaged. On an average, her posts receive 500 shares. If you genuinely want to help the parenting community, then I have a couple of ideas for you. Pregnant women need a lot of care during pregnancy. There could be some complicated cases where special care is required (including the food, exercise and other daily activities). Thousands of women are looking out for help in pre-pregnancy and post-pregnancy stage. A mother forgets about herself once the baby comes in her hands. Her entire focus shifts to the new born baby. There is an equal opportunity to do a great work by helping mothers in the critical stage. Start with one segment of parenting where you have most of the interest, make some business and expand the scope of your business. I loved this idea because I am a believer of using home remedies for the common diseases. We don’t use or recommend chemical based treatment unless it becomes the only option. We even observed that our immune system became stronger since we denied the unnecessary use of medicines. Caution: Do a good research before writing any home remedy. Try it with your own baby before recommending to others. We (including Neha) have seen some facebook groups where mothers discuss issues related to breastfeeding only. I loved the idea of staying in a niche within an industry. If you (as a mother) experienced issues with breastfeeding, you can come up with a support as a group for the other mothers. This is another niche to be explored within parenting domain. There could be many different ways to start your venture to help mothers come out of postnatal depression. Some mothers face the issue severely while some comes out of the depression phase easily. But, almost every mother faces mood swings after pregnancy. Pregnancy and motherhood are the most beautiful phases of one’s life. In my personal opinion, no mother should work during this phase and rather enjoy her life with her baby and family. After few years, when the child starts going to school, a women feels a need to express herself through work. There might be a monetary need but most of the time it’s the need to feel the inner completeness and self-satisfaction. Some startups are already helping women in getting job and starting ventures. The market is too big that you can be the next successful venture. The idea revolves around the consumption of video content. Last year one of our videos had gone viral and has been viewed by more than 4 million people. That’s the power of videos. Just one viral video can make you popular in your industry. There is so much requirement for the quality content in childcare and activities. Some companies in parenting domain got funded last year. Their business model is simple, get the parents in their app, show them engaging content, and make money from partnerships with the baby care brands and hospitals. You can decide to sell the baby products on your own website. If you don’t want to raise money from VCs for your venture, stay bootstrapped like me. Build a great content and make money from advertisements and affiliate marketing. Don’t depend on money from advertisements. Search for partnerships and affiliates and once you have more than 10,000 monthly traffic on your website, you can start earning 5,000 to 10,000 rupees as you grow your traffic. If you find the right partners for your business, you can make more than 100,000 rupees just by sending a few leads to hospitals or you can charge 25,000 rupees for reviewing a newly launched product of big brands like Johnson & Johnson, Dove or Himalayas. All this depends on your own hustle and the quality of traffic that you have on your website. It’s my favorite domain. I love talking about startups and content marketing. I am planning to write a lot of stuff on running businesses with low investment while getting high returns. Content marketing is the core of the success of my online business. There are a few so-called startup experts who try to cheat young startup entrepreneurs. Be careful when you take advice from anyone. Check the background of that person, what he had done in the past and what is his core competency. If you have experience in startup or marketing, then you can find a lot of ideas for new businesses. I have gone through the phase of starting one product startup from the scratch, then joining a funded startup as the marketing co-founder, working on many freelance writing and marketing projects and last year I even resigned from a job where I was heading the content marketing. My online business is my biggest source of income without my active participation. I have a lot of ideas in my mind and I know how to execute them well. But, I execute only a few ideas and share the rest of them with you, so that you can also live on a passive income source. If you know how to teach people in building passive sources of income then please join the mission of making people self dependent (and financially independent). The next big issue is ‘selling the products’ in the startup. If you have a good experience in sales, help other startups. Don’t be afraid of sharing your knowledge with others. I know how we struggled for a single sale in our first startup where we were selling ERP to schools. I learned sales process by failing at it multiple times. Some of the books and blog articles helped me. I am grateful to those people who helped me. Well, do you sense a business opportunity here? If you look closely at the startups, you will find one startup idea every day. I am suggesting you to become a startup for startups. Finding a great design for website and app is the third biggest challenge for startups. Can you provide high quality design (designers) to startups at an affordable cost? We could save a lot of money by avoiding hiring of a bad guy (who ran away after two months with our laptop). We caught him eventually but we wasted so much time in the chase. He was a designer. He was a bad hire. We should have fired him after first month only. But, it was our bad and it was proved that delayed firing is more dangerous than a bad hiring. Rule of running a successful startup – “Hire slow but fire fast when you are in doubt”. If you know how to find the right candidates for a startup, you can help a lot of startups, who are losing a lot of value because of bad hiring process. You can come up with your own innovative ideas to select the right candidates for the right job position. That’s what I do at my startup. I do marketing without spending a single paisa on paid marketing. If you know content marketing, you can help many startups, which are looking out for the growth organically. A lot of people ask me to work on their startup marketing but I have to say NO to them because I do not have that much time. There is a lot of demand for good content marketing guys in the market. You can be the next successful guy if you want to build your career in content marketing. Many people consider digital marketing and content marketing as same. Digital marketing is more about driving traffic to your website and app through paid mediums like Google Ads and Facebook Ads. Content marketing is more about organic growth with the help of articles, videos and graphics (fueled with compelling stories). If I can bring one lead at a cost of 100 rupees, a digital marketing expert can bring one lead at 50 rupees. Digital marketing is all about understanding the data and optimizing the cost. If you understand Facebook or Google then you can optimize the Ads to optimize ROI. I can also create Ads on Facebook but I just know the basics. Learn the basics, try some digital marketing for yourself and you can become a digital marketing agency. My friend Deepak teaches digital marketing free of cost. You can get most of your initial audience from the Facebook. Your content can go viral if you create a high value content for startups. There are already so many groups dedicated to startups, marketing, blogging and seo. Once you have an audience, you can start selling your services to startups. Affiliate and display Ad marketing will always remain an option for you. Depending upon your skills, you can charge 20,000 to 50,000 rupees to sell your services. There are so many technical products that you can promote to make affiliate income from $10 to $100 per conversion. If you make 10 conversions of $100 per product, you can reach to 65,000 rupees per month income. This is very much doable if you put your brain and heart at work. You can get multiple online business ideas if you look at any news portal. Let’s see what you can get from NDTV news website. You can make a niche media website for business, movies, cricket, food, tech, auto, apps, art, wedding and elections. You can become a media outlet in any domain in which you have interest. There might be many channels that share the bollywood news but the market is not saturated. You can still write movie reviews and find interesting stories of celebrities that people want to read. Your success depends on your promotion capabilities. You don’t have to compete with yourstory or inc42. There is enough room in the startup ecosystem to find stories from many different angles. You can take interviews of startup founders in a particular area and celebrate the whole month on that topic. For example, write stories on funding in February, matching co-founders in March, acquisition in April.. and so on. If you have a mind of an entrepreneur, you can be innovative at each step of your career. If you are a passionate tech lover and spend many hours reading about latest trends in technology then why not start an online business in the same niche. I already gave you the source for generating as many ideas as you wish. You can go deeper into the software development technology, tools or design tech. There are infinite opportunities if you keep your eyes open. Tech and gadgets are in the similar domain. You may include both on your portal or start with your niche products. If I would have to start, I would pick just one product or a range of products from a company. You can go for the expanded scope at a later stage. You can make an exclusive news portal on Apple products only. Make sure to keep the quality so high that you become the first source of contact if I need any information about iPhone, iPad or Macbooks. A great opportunity for all the young ladies who are fascinated by the latest trends in the fashion market. When we say fashion, the first impression that comes to our mind is the western fashion. You can get the same success even if you are interested in Indian fashion trends. Saree and Kurtas are the all time favorites of Indian women. Help them choosing online what’s trending in the market. Once it used to be my favorite domain but there was so much noise in it that I stopped reading stock and business news. I do not trust the so-called market gurus who advise anything for their own benefit. There are a very few people who write about the important and useful information for investors. Here comes an opportunity for you. If you are really interested in stocks or business, then become a trusted source of information. You can make a good business only after doing a remarkable work in any field. Do not pick my ideas to add more noise on the Internet. Special Note: Many people underestimate themselves and are afraid of taking the first step. Here, please don’t be like me, my older version as 10 years ago. I thought about starting my business in 2007 and took the actual step in 2013. You, yourself can guess what I missed out. I wasted 6 years just in thinking. It’s better to fail after trying something than feeling safe without taking any action. The best way to make money from news portal is by the Display Ads. But, if you are making something in very niche segment (like Apple products) then you can make a great income from affiliate marketing. You can promote paid apps from apple store as well as sell apple products through Amazon and Flipkart. Depending upon the audience profile and niche, you can start making income after hitting 10,000 monthly traffic on your website. If you can make a consistent traffic then you can make 50,000 to 100,000 per month within one year. Why would you fail at Facebook marketing? If you are building a tech product or you belong to some boring profession like accounting or legal services, then most likely you will fail on facebook marketing. Because people spend time on Facebook to enjoy, watch videos, share photos and read masala articles. No one wants to buy your stuff. Don’t burn your time and money on Facebook if your audience is not active on social media. There are certain categories where Facebook fails but google rocks. In few categories, both facebook and google works, like Fashion, Deals, Health, Food and Travel. I have not listed these under Facebook because google dominates them in traffic. You also get high quality readers from google in those categories. Software engineers can easily start an online business in tech industry. If you are running short of ideas then just look at Stack Overflow community. If you are a techie, you must have come across stackoverflow posts when searching for your tech queries. No, you don’t have to compete with the StackOverflow community rather focus on your niche. You can do much better job than StackOverflow if you create awesome content in one single area. People used to search google for restaurants but then Zomato picked up the niche and dominated the restaurant discovery. Can you become Zomato of your tech industry? You will still get 90% of traffic from google. Zomato gets more than 75% traffic from google search engine. It is difficult for me to write all the ideas in detail. I will give you a single line hint and you can refine ideas based on your interests and capabilities. There can be more than 100 ideas within the tech startup domain. Think, what you can do the best. If you have a little experience in mobile development, just move forward with the implementation of your idea. You will get more opportunities to grow even if your app failed in making money for you. Communities will always remain the source of trusted information from the real users. Reddit, StackOverflow and Zomato are the communities of passionate people who want to help each other. You can come up with a new community in your niche. I am not giving you the ideas of tech blogs in this article as my purpose is to show you the potential of writing a blog on any technology. If you have something in your mind, do your keyword research and start a blog. There was no opportunity in e-commerce few years back. But, now Indians are very comfortable in buying everything online. Here is the list of best shopping websites in India to buy electronics, books, furniture, clothes and groceries. I am not sure if Flipkart or Snapdeal would be able to make profit or not, but I am sure that you can make a lot of money in e-commerce. See, more than 10,000 people search for buying mobile phones in india. You don’t have to compete against them in the same segment. In fact, you don’t have to start your own e-commerce portal. My suggestion is to take advantage of the existing players who have already built a platform for shopping online. You can sell anything and everything online with the help of market places like Flipkart, Amazon, Snapdeal, and Paytm. You can start with the small quantity of a product from the market and label it with your brand in order to resale. Find easy to ship things like sunglasses, clothes, stationery and fashion material. Pick only good material stuff otherwise you will lose your brand even before its establishment. Once you learn how to sell and make some money (even without profit) you can negotiate with the factory to get a much lower cost material and can make higher margin on bigger sales orders. Deals and coupons are the primary motivation for Indian consumers to buy online. However, there are so many players in the market who are selling online deals and coupons, you can still make a good money if you know how to reach out to the right audience that is searching for deals and coupons. You have to learn about starting an affiliate website and making money out of it. There is a lot of material available online if you really want to learn and grow. I can also write some articles on affiliate marketing. You can find some hints in many sections of this article as well. You know women spend a lot of money on fashion and beauty products. There is no doubt that they become fashion expert naturally as they use the products. If you love fashion, then why not start an online business. See how many people are searching for simple term like “beauty tips for glowing skin” – 1900 searches every month and 2900 searches if you can write in Hindi. Similarly you can find tons of keywords that people keep on searching online related to fashion. Some ideas for you to move forward. Top fashion bloggers Urmi Daga and Hemal Ved started WhatWearHow. These two friends started their blog in 2010 and created excellent content for their viewers. Brands have gone onto create videos with them in order to promote through their channel. I am not a fashion expert, but I can suggest you some tips based on my research. You can come up with a better idea if you are passionate about fashion. Know your audience and dress accordingly. Give fashion and styling tips. Fashion is all about glamour, so make sure your images are absolutely fantastic. Dull images are a complete put off. Maintain a healthy instagram channel/account. Give honest reviews about products, sizes and styling. If you have a good number of followers on instagram, companies would give you free clothes and money just to tag your handle on their post. The money would depend directly on your instagram following. I started my blog cash overflow to share my personal experiences in finance and money management. In a short period of time (14 months), my blog started receiving around 10,000 visitors each month. I was writing about wealth management, investments and savings, but realized that online business is the best way to find financial freedom. Then I started to write about generating passive income because I feel that it is the better way of making money than investments. Should I share the tips for finance? It’s my own domain of writing. You may become my competitor if you know more than me on the topic of finance. Should I be afraid of the competition or tell you how to build a strong personal finance online business? Ok, I am not afraid of new competition. Because one day I will lose the traffic anyway. Nothing is permanent and we should not be so possessive about our assets. I got the traffic because of my hard work. You will get traffic with your hard work. You will be my friend if I help you. Friends are more important in life than money and traffic on website. If you are an expert in the field of finance, then the Internet is full of opportunities for you. You can sell Insurance, Mutual Funds, Home Loans online like an offline agent. Banks are ready to share commission with you if you send them leads. As the number of options to choose from is very high, the consumers get confused that which product they should buy and from where to buy it. Can you help people in finding the best health insurance, life insurance, auto insurance, investment policies, credit cards, mutual funds, personal loan and home loan? users in selecting the product that best suits their needs. After you have helped the user in selecting the product – you can even sell that financial product to your users online. PolicyBazaar, Coverfox and BankBazaar are running on this business model. Very few people understand how Income Tax is levied in India. And, even if they understand – they don’t have the confidence to file their Income Tax Return (ITR) themselves. 90% of the people in India don’t file their Income Tax Return themselves and rather prefer to get it filed through someone else. Now, here is the opportunity. Income Tax Return filing is mandatory for everyone even if your income is not under tax bracket. You can help people in filing income tax online. You can charge a small fee from the client for filing his Income Tax Return. The estimated fees charged for ITR filing of a salaried individual is Rs. 200 to 500. For business Income ITR filing cost is Rs. 5000. You can sell more related services like company registration, GST registration, TDS returns, customised monthly packages and start-up packages. ClearTax and H&R Block are running on this business model. The content written in newspapers is mostly written by Journalists who have little knowledge about complicated financial aspects. This is one of the reasons why very few journalists write about complicated financial aspects and only cover the general news. It’s difficult to find a high quality unbiased content regarding financial management. For Indian audience, you can expect to earn around Rs. 80 to Rs. 200 for 1000 pageviews through a financial blog. Youtube can give you more income through advertisements. You can also earn affiliate commission through sale of products on your website. Many successful blogs like ApnaPlan, Taxguru and Relakhs are making a decent amount by this way. I also earn money through Ads and affiliate marketing. People face issues with their finances like How to invest, Where to invest, How to save tax, How to set your financial goals and retirement planning. Google ends up confusing them rather than helping them when they search online. Google can split up articles on a particular topic but cannot make a personalized plan for anyone. This is where the role of financial expert comes into play. If you are a financial advisor, provide customised financial advise to people over the phone and solve all their queries. You can charge your clients on a per appointment basis. Financial Experts usually charge Rs. 500 to Rs. 1,000 per appointment. The duration of the appointment is usually 15 to 30 minutes. This works out to Rs. 1000 to Rs. 2000 per hour and Rs. 10,000 to Rs. 20,000 per day. People like Nitin Bhatia, Karan Batra are earning money through this business model. The content currently available on the Internet for free may or may not be well researched and may also not provide the detailed insights. To solve this problem, some authors do detailed research and then sell this research for a small fee. If you can do conduct research on financial products then you can sell reports and e-books from Rs. 50 to 1000. Subscription based content is certainly picking up around the globe and has massive potential. Jagoinvestor, Capitalmind are running on this business model. I would love to execute this idea sometime. I am a finance geek and look for more people who want to have in-depth discussions on finance, economics and money. If you can think beyond retirement, investments and money generation then you can understand my point. Money has a certain power but a very few people are able to use that power for the empowerment of humanity. Write to me if you have thoughts around this area, maybe I can become a part of your community. If you are not a CA or legal financial advisor, you can easily help people with accounting being graduated in finance or commerce. There are multiple ways of helping people in managing accounts. Startups which are running their business with frugality, you can help them in managing their accounts. You can find your initial clients easily if you want to work hard. You can get partnerships with CAs to complete the tax filing work. There are few people who publish good videos on finance related topics. You can start your own video blog on YouTube. It’s all about the hard work, but you will love the income when your videos will be viewed by millions of people. If you are seriously interested in starting your online business, you can find more ideas than I can think for you. The easiest way to start something online is by starting helping people by sharing your knowledge. If you have studied anything in finance field, then you can start helping students in clearing their finance exams. Mathematics and Finance subject is considered as tough to crack, you can find an opportunity where people feel difficulty. Healthcare domain is very sensitive. You must think about getting into healthcare if you are really passionate about improving the health of people. Don’t just start something because someone said that Indian consumer spends billions on healthcare every year. I have some ideas to work on health but these never became priority for me. Last year I joined a baby healthcare startup but left the job in a few months. My first two startups were into the education field. Both failed because of different reasons. The cost of failure was high but the overall learning outcome was better than doing an MBA degree. My failure in education startup does not mean that you will also fail. I can share my learning with you so that you can taste the success. Before starting anything in education, you have to figure out which audience you want to target. If you are trying to make a solution for everyone, I am afraid you are cooking a recipe for your failure. Find what people are searching online related to exam preparation. Students who have completed their graduation are searching the above keywords. In the similar way you can see that more than 10,000 people are looking for career counseling in India. Idea #74 Platform for dealing with raising teen issues, resources and tips. There is plenty of stuff for the age group 0-9 but not much for teens. We started some experiments with online jobs section in India. The segment has a huge search volume. The keyword “online jobs in India” has over 11,000 searches every month. Similarly the keyword “government job” has over 15,000 search volume. If you go by each keyword, you will find keywords worth more than 10 million search volume. We started one experiment last year in the segment, one simple blog to share information about government jobs. In about six months, we started getting more than 15,000 traffic on the blog. We recovered our invested money in a few months and decided not to invest more time into the online jobs section. Because I am more interested in writing on things where I enjoy doing research (Finance and Business). You should also pick something related to your passion. The blog is still making a few dollars every month without our involvement. I am ready to sell the blog at $1000 if anyone wants to build a genuine business out of it. Since the demand is there, you can execute many ideas in this field. Do you know how many groups related to food exist on Facebook with more than 10,000 memberships? More than 100 groups. Every group is unique in itself with millions of people who are interested in sharing recipes, cooking techniques and nutritional information. Do you how many people search about ‘recipes’ every month in India alone? More than 90,000 people. Here is the snapshot that will show you the search volume of different combinations of recipes. You should not start doing something in food segment randomly. Rather pick one niche topic where you feel for the most combinations. It can be baking, italian, paneer, snacks or just mushroom recipes. Do you want to see what else people are searching for mushroom recipes? You can get 2900 monthly visitors for mushroom gravy recipes alone. Let me give you one more insight that the data is a pure estimation of traffic. The real traffic would be a lot more with all sorts of different combinations of mushroom recipes. This much research should give you enough confidence to start your own online food business. A lot of startups are already into food delivery and restaurant discovery business like Zomato. Don’t follow them. Follow your inner self for building a great business. # Idea 88 Sharing recipes in very selective niche – for example Mushroom Recipes. Do you know who owns mushroomrecipes.in? I own the domain name so that I can start a food blog or sell the domain at a premium price in the future. Don’t let anyone else choose the premium domain in your loved niche. I will keep on writing, but my ideas will not take you anywhere unless you take your first step of implementing anything. Travel is one of the top priorities of my life. I want to see the world before I become too old to enjoy travelling. That’s why we spent one month in Goa in 2015, 50 days in Thailand in summers of 2016 and travelled the entire January 2017 by road from Chandigarh to Karnataka. We started our travel blog to share our journey and tips to stay in budget while not compromising with the style and luxury. Just after starting our blog, we got an offer from HolidayIQ to submit a video review of a hotel. We enjoyed our weekend vacation in Shimla, recorded a video review of hotel and received 10,000 rupees in our account for submitting video reiew. It was more than what we spent on our vacation. Travel is the one industry where you cannot go wrong at all. There is hardly any scope of failure. A few years old startup AirBnb became multi billion startup without owning any hotel. I am not sure if you would like to create another breakthrough startup like AirBnb, but you can definitely make something to generate regular income of 100,000 rupees per month or at least enjoy free travel like us. # Idea 97 Review of high-end luxury hotels. # Idea 103 Travelling with kids and overcoming various challenges. TravelBuffer will talk about the topic from Neha’s point of view. I spent more than 50 hours in the research and in taking feedback from people. All my efforts will be a complete waste if you don’t take any action. Seriously, no one can help you in becoming successful. It’s all in your own hands. As The Morpheus says to Neo in the movie Matrix, “I can show you the path, you have to walk on it”. Someone shown me the path and I walked. Don’t waste your time in thinking without taking action. I am available to help you out. If you are stuck somewhere, write in the comments, I read all the comments and reply whenever I get time. I am thankful to my friends Karan Batra, (founder of Chartered Club) and Akshay Jain (founder of CustomBaba) for their contribution and research to complete this article. Leave your comments, and I will respond soon I get time. Hi am also looking to start my own online business. I also love to write articles and love to talk people. Can you help me out for good platform to write article and give me some good suggestion??? Hi Ankur, I’m Wasim, Which type of article writing you are interested ? Great Article Sir. I really liked all of your ideas. sir,I’m very keen to start a business..but I’m a college student studying 2nd year engineering.so i’ll not have much time for business..but I badly want to start something.I would be grateful if you could suggest me any idea regarding a business which requires low capital and time. it great article for startups. I am also looking for the new ideas to start my own business. My basic background is automotive and marketing. I didn’t found anything related to automotive. for marketing I got some ideas. Can you help me to start in automotive? you are doing a great work! Professional Tax registration is mandatory for the business within 30 days of employing staff and for professionals within 30 days of start practicing. The professional tax has to be deducted from the salary/wages paid. I really liked this article. It’s full of knowledge. Could you please guide me step by step on how to start my own blog with complete process involved in it. For long I am thinking of making some passive income through part time through internet. I have’nt started one yet. Your article has been an excellent source of information and ideas for a novice like me. It has been a very great eye opener to me. Thank you very much for that. I would be very happy to be in touch with you for setting up my own internet business and I would be very eagerly looking forward to you on this. Thank you sir for sharing such a worthy information so simply. I have interest in spirituality and read a lot of spiritual books, quotes etc. Do you think i would be successful in starting a spiritual blog as most of the content would be as told by masters/gurus? Hello sir your blog is ossom very inspirational it’s my 1st time I read your and it made me worthy please help me I want to start youtube channel. And thank you so much for sharing ideas with us. Awaiting your reply sir….